The Salomon Sabotage is a perfect balance of edge hold, pop, speed and playfulness. There are many hybrid camber boards out this year that we really liked, but the Salomon Sabotage stood a little ahead of the all mountain freestyle pack. It had a liveliness and all around feel in almost every situation to it that is kind of intangibly better. Not much has changed from 2013-2014 and it’s still a great ride. Conditions: Borderline icy snow to less than a foot of thick sierra snow. Bindings: Salomon Holigram, Union Contact Pro, Burton Cartel, Burton Cartel Limited. Set Up- 22.5-23″ wide 15 front -15 back Centered stance. The Salomon Sabotage is a board that can satisfy the camber board lover as well as fans of the newer hybrid designs. This is one of our favorite low cost all mountain freestyle boards out there. It’s very stable between the feet, poppy and a great all condition do anything kind of ride. This comes in two models. The standard orange top sheet model that you will mostly see and the Classicks model with a black top sheet. The Classicks is a little lighter so some might prefer that because we felt the orange was a bit on the heavy side. On Snow Feel: This is a fun mountain board for all speeds and moods of riding. If you want to slow down and have fun it’s there for you just as much if you want to take on the mountain at higher speeds. Regular or switch this is fun in just about any condition. It likes the pipe and jumps as well but isn’t terrible in the jib park either. It almost feels like a 100% camber board but the tip and tail act a little more playful like a hybrid shape. Very stable between the feet. Powder: This is a true twin with a centered stance and a lot of camber going on here so this isn’t going to be great in powder. It’s tail/tip turns up a bit offering a little rocker but this is only really better than a true camber board. It’s going to be some work here but those that like camber still will appreciate the added float. Turn Initiation and Carving– On the easy side of Moderate. It’s fun to make any kind of turn on this board. Short Radius turns are pretty responsive and medium radius turns are fun. When you lay into a carve there is a nice positive return coming out of it. The pop here really makes carving fun and it’s better than most twins we came across. There isn’t one kind of turn that stands out as the best but all were just shy of being excellent. It has the camber feel with less of the camber consequences when you aren’t on your game. Speed: This isn’t as fast as the Burner but it handles chatter very well without punishing you when the terrain is less than ideal. Salomon understands speed well and even some of their more all mountain freestyle focused boards seem to benefit from it. Uneven Terrain: It didn’t have that typical feel that the Villain or Man’s board did that wants to make you pay for riding slow in crappy hard terrain. It’s not the best out there but it can handle most conditions well with a good pair of shock absorbent bindings. Approximate Weight– Easy on the average Knee going up the chair lift. It didn’t feel heavy or like a fly weight. It just felt like it was in the middle ground. Edge Hold: Salomon has some good side cut’s that offer what we feel is the perfect kind of edge hold. It is not overly grippy and performs well in everything except ice. From Snowment to powder the edge hold feels appropriate. If you are a rider who lives in icy places like the East Coast you might benefit more from a board with magnetraction but it’s not going to be a night mare. Flex: Salomon Calls this an 8 when it comes to flex but to us it feels more like a 5. From outside the bindings to the tip/tail the flex feels soft and easy to butter. In between the bindings the flex is stiffer. This is the flex that will allow you to straight line a hill one run and butter around on the next. We really like this flex configuration. For us it felt like there was speed without the consequences of a stiff flex. Switch: This is a true twin so either way rides better. The only thing we found that rides switch better is boards with asymmetrical side cuts. Jibbing– Probably the only weak point with this board but it’s still ok for less than technical. Pipe: What a fun Pipe Board. The edge hold combined with the springy return from a carve transitions well to the pipe. You can carve through the flats and climb a pipe wall very well. It’s also a more forgiving than a standard camber board. Right in-between a hybrid shaped board and a camber board. If you wanted to lap the pipe all day you won’t be disappointed. Jumps: Another excellent board for hitting the jumps or popping off anything on the mountain. It’s very easy to ollie and we felt it was one of the best boards in the Solomon line when it comes to pure pop for ollies or any size kicker as well. We try to get as many images of the Salomon Sabotage, but forgive us if they're not all there. Bought the 2013 158W as my first board after doing quite a bit of research. Just a little info about my snowboarding background, NONE! Started two years ago, at the ripe age of 30, and have been addicted ever since! As for the board....EXCELENT...easy to ride for being so stable and mostly camber. I rode one of my family members Park Pickle back to back with this, and although not nearly as playful and forgiving, it challenged my riding without being a handful. There was plenty of room for growth for me and my skills as an entry level snowboarder. Great for carving, high speed descents, all types of jumps, ollies, nollies, great pop, buttering. I do have to mention that I started with 2012 Burton Custom bindings and upgraded to the 2013 Burton Cartel Limited, which I happened to stumble across for half price, and it made a world of difference in terms of board performance. I soon realized what the term chatter really meant and my ankles/knees/body have been thankful and beyond. As I've mentioned before, I am highly addicted to snowboarding....and what better way to explore that addiction than travel. I made my way to many resorts....Big Bear, Mammoth, Keystone, A Basin and Whistler Blackcomb....along with one heliboarding trip out of Pemberton BC in which we received 3ft of fresh powder....all with this board. It does groomers, powder, park, Jibs/rails (although now realizing the flex is a little stiff and there are better boards) and cruising about. Can't say enough for this board! I have since moved to the 2014 Forest Bailey Space Case for the upcoming season. After getting a chance to demo this for a day I found how well this complimented my riding style...just blew my mind!...more on that later. This board really is fun, I chose a 156. I'm a natural free rider, but wanted something more playful than my Jones Flagship for poorer snow conditions and for hanging out with my free styling friends. The Sabotage quickly became my go to board. It's a great all rounder, you can play around on this thing in the park or take it down steep blacks with ease. It has great edge hold but at the same time lots of flex and despite what the review says is quite light and extremely manoeuvrable allowing for tighter turns and as a result more speed through difficult terrain. True my jones is much faster and stable on a steep freshly groomed piste, but add a few bumps and the manoeuvrability of the sabotage really takes over. Also great pop, this board just flies off natural kickers! Really fun board, but I've already said that haven't I? What a fun board! I bought a 154 on sale as I normally ride a 161 / 157W for pow days and needed something less serious and more fun for average conditions. I was disappointed one day that I had 20cm of fresh pow because it meant I was riding one of my older boards and not this! This board makes hardpack fun. Carve on a groomer and it feels great. Look for features to pop and drop off and it takes whatever you throw at it. The biggest issue I have had with it is when bombing down chopped up areas. I use very stiff bindings and they are probably too responsive and transmit any little mistake I make directly to the board and conversely, I feel the softness of the board straight through the bindings over rough stuff at speed. Still, it just encourages me to slow things down a bit and have more fun! 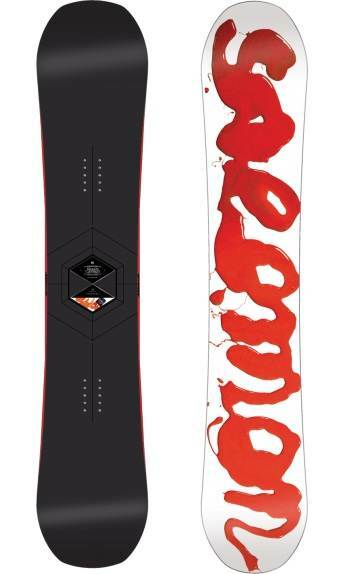 Lovely board that is destined to by my main ride in the coming seasons thanks to its versatility and outright fun factor. This has to be one of my favourite boards ever, it is fun, fast and given its great performance and pop pretty friendly. Piste runs are fun, it is lively and turns very well, whilst not having that heavy tank like feeling alot of stiffer boards have. As the guys at good ride have mentioned it is mad fun on kickers and natural hits - the popster core flex pattern make it feel like it is made to pop off everything in sight! On boxes it is forgiving and nice to ride but it is not really a rail board in my opinion, but that said you can still butter it around. In pow it exceeded my expectations, the flex and popster core allow the board to flex a little making it pretty nice to ride in pow in my opinion - it was way better than a standard camber board. All in all I really liked this - 5 stars.